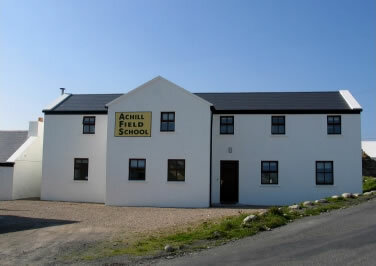 The Achill Field School was established in 1991 as a Training School for students of archaeology, anthropology and related disciplines. The Field School is based at the Archaeology Centre in Dooagh, Slievemore and other town lands in Achill Civil Parish, all situated in County Mayo on the Wild Atlantic Way of Ireland’s west coast. Since its inception, Achill Field School has undertaken research on many different aspects of the island’s archaeology that has included excavation of selected sites and extensive digital surveys. Theresa McDonald’s book ‘Achill Island: archaeology – history – folklore’ (1997. Reprint 2006), documented the history and archaeology of the island from the Mesolithic to the Post Medieval period. Former students of the Field School have returned to Achill to carry out their own research projects on the Iron Age promontory forts, ceramics from the Deserted Village, Bronze Age roundhouses, Post Medieval Field Systems, Napoleonic Towers, the Boycott House and Shell Midden sites. Many more monuments/sites wait to be explored and researched. Many undergraduate projects have also been undertaken on various aspects of the archaeology of Achill and submitted to the student’s respective universities as part of their degree award/s. Historically the field school has catered to students from North America, Europe and Australia interested in academic and practical fieldwork components over the course of the 2 week, 4 week and 6 week modules in our archaeology field school courses, which come with 3, 6 and 9 Semester hours of academic credit from the National University of Ireland Galway. Our 10-week Archaeology Trainee Supervisor course introduced in 2009 has been a run-away success and is generally undertaken by former students who have previously completed one of our 4-week or 6-week modules. For full details of the Achill Field School, its courses, research and findings, facilities and location, please visit www.achill-fieldschool.com.